Twin Otter Studios recently launched a Kickstarter campaign for their SRPG, Arcadian Atlas. 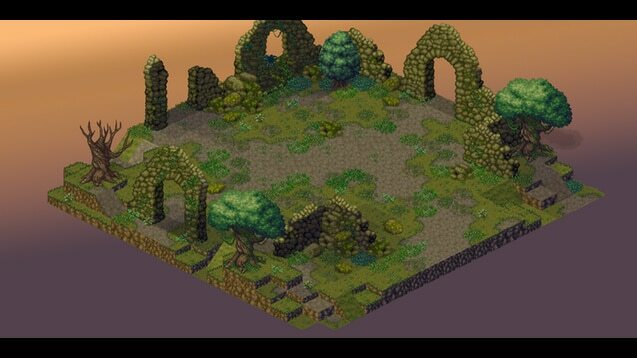 The title will feature pixelated art style done in an isometric view to pay homage to certain classics in the genre. However, the brother and sister duo of Twin Otter Studios (fraternal twins maybe?) seem to have a unique vision for the game while also having a firm grasp on how to keep their goals realistic. The story of Arcadian Atlas focuses on two royal guards of a crumbling monarchy. After losing her parents, Vashti grows up too fast and sees the horrors of the world. She finds solace while taking care of the injured Desmond, a charming and humorous compatriot. But like all tragic love stories, the two are pulled apart by different factions and ideologies. With the Arcadian kingdom in shambles, an invading army from the East, and a power struggle over the throne, can these two guards find any peace with (or without) the other? This gameplay seems a lot more fun than consulting an actual atlas. 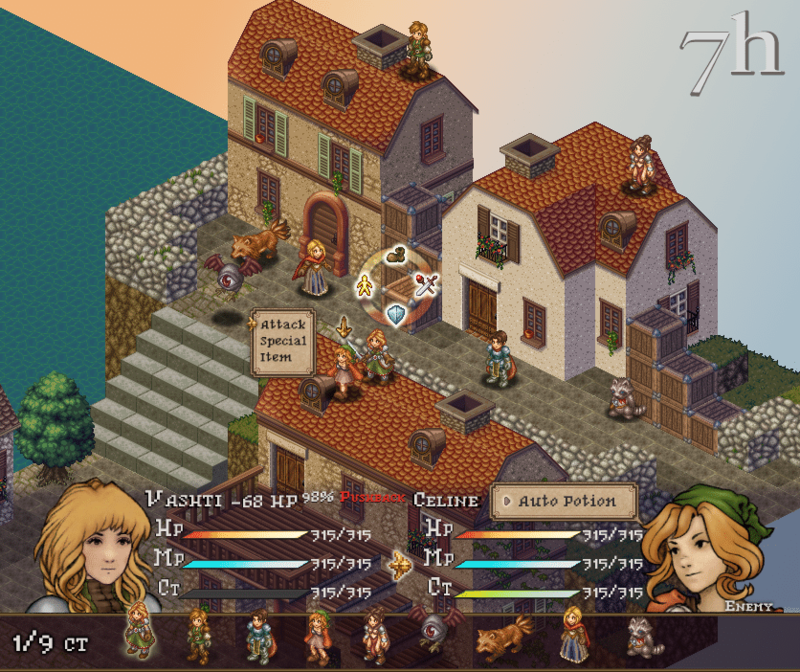 The gameplay featured in the game in similar to most isometric SRPGs: you move your troops (with specific classes) around one by one on a battlefield grid and then select an action to end your turn. Flank attacks usually do more damage so positioning is usually a big part of the strategy. Arcadian Atlas throws a few fresh ideas into the mix with more of a focus on terrain and a class system that discourages jumping between different jobs. I’ve always wanted to see an SRPG that let me cast a lightning spell in a river and electrocute everyone in the water; while Twin Otter doesn’t describe that exact scenario, they do explain that ‘[you can] place your apothecary opposite an enemy knight with rushing rapids between them while you wear away his armor with acid bottles.’ The potion-tossing job has some usual companions with the ranger class and rogue class (represented by an adorable raccoon). And while you lose a bunch of skill points when switching between base/core job classes, each individual designation will allow the player some flexibility in making each character different. 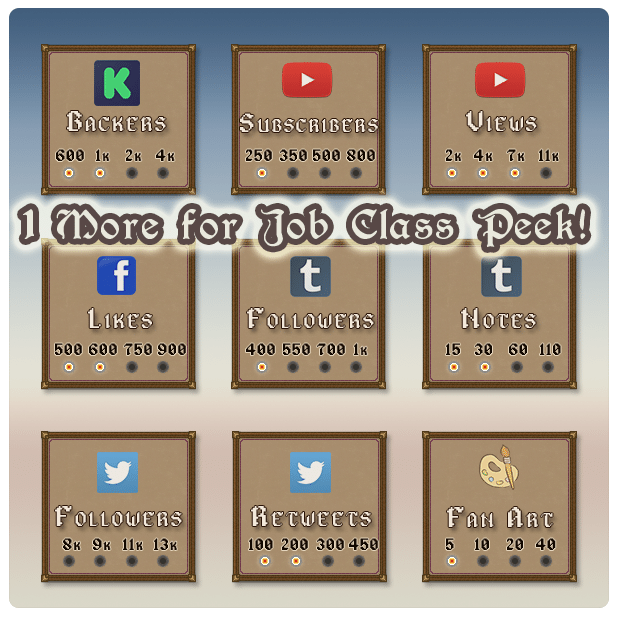 For instance each class will have its own skill tree to unlock and two advance classes to choose between at higher levels. Who’s a cute raccoon getting pierced by an arrow? Yes, you are! The music in Arcadian Atlas is given a central focus in the campaign page due to the unique sounds of Moritz P.G. Katz. Twin Otter are trying to avoid the symphonic and chiptune trappings of most RPGs and promote an interesting blend of mostly jazz, funk and some trip hop. At first I wasn’t sold on this strange deviation but after listening to a few of Mortiz’s tracks I understood better how it would fit into the world. The tracks mostly are (jazz?) symphonic with grandiose fantasy gestures thrown in like in the Teaser Overture but you get more of sense of the funkier sounds in the great Shop Til You Drop (known as Shop Theme on the campaign page). With that track you hear a smooth baseline underneath a brass section with a tendency for flair. It’s all introduced with the cool sounds of gold coins scattering on a counter top. There are a lot of elements that make it seem like this is a Kickstarter being run by people that understand the platform. The sections on different aspects of the game are short and informative. There’s plenty of gameplay on display and you get a clear idea how it will work. There are no grandiose claims and they even state that with the base funding goal of $90,000 USD they expect the game to be a sensible 10 hours long. Twin Otter have taken a cue from the meta-achievements of the Bloodstained and Pyschonauts 2 campaigns and given their backers social media goals (e.g. 2000 views for their YouTube video) to help spread the word and promote community interaction. They’ve linked to most virtual channels that have been specifically tailored for Arcadian Atlas. They’ve even gone as far to have separate links to encourage retweets and to view notes in Tumblr. With all this planning it’s strange that the Steam greenlight for the game has been overlooked and is tucked away in one of the campaign updates. So should you go run to your wallets and make it rain on your computers/laptops for this project? Not necessarily. A well planned Kickstarter could still just be all surface decoration with little substance underneath. As always and forevermore, the best thing to do before supporting a campaign is research. I always find that demos or older games are a good way to get a sense of the product a certain studio can create. There’s mention of Becca and Taylor Bair‘s (the brother and sister team of Twin Otter Studio) first RPG called Genesis. I searched and searched and it’s like this game doesn’t exist online. I found more luck with Vidar, an RPG puzzler and Kickstarter success story which Becca did the art for. You can grab a demo for the game and the ongoing dev blog means that this title is on track to a full release. There’s also a free browser version of a completed multiplayer space-shooter called Solar Crusaders but it’s unclear who on Twin Otter helped out with this game. But seriously Becca and Taylor, are you guys actually twins? Something that I also came across and couldn’t substantiate was Becca and Taylor’s claim of the team having ’18 years in the industry’. By looking through a few virtual resumes and CVs I could only find experience going back to the early 2010s. It’s possible Team Otter collectively has been working on game for 18 years or that there are members of their studio that they haven’t announced that have nearly 2 decades in the field. But this statement really stuck out since the two siblings are quite young and most likely in their mid 20s. As of writing this article Arcadian Atlas has over 35% of its $90,000 USD goal and still has 3 and a half weeks to go. The pledge tiers for the campaign have the digital copy at $20 USD, a newly announced beta testing opportunity at $40 USD, a physical art book at $160 USD, a special accessory (the raccooninator) that may turn enemies into raccoons at $190 USD, and the ability to design your own quest at $600 USD. Two stretch goals have been teased for the project but the funds required have not been announced yet. The first is the (promising) opportunity to have ‘private actions’ with your troops that will unlock conversations and develop relationship skills through this interaction. The second is a bonus scenario that allows you to venture to the east to the thief infested lands of Volin. And while not stated as a stretch goal specifically, the team states that, “our dream game (essentially double that funding goal) will double that content with expanded story missions, side quests, customization options, and more classes/skills.” So it seems that at $180,000 USD the game will become Arcadian Atlas x2 with a whole bunch of additions to make an even more robust experience. Why didn’t we learn more about that awesome looking deer demon? If you want to contribute to the Arcardian Atlas, which admittedly has a lot going for it, you can do so until May 9th, 9:00am EDT. The team is hoping for a early 2018 release for PC, Mac and Linux. There’s going to be a lot to look out for here since Twin Otter Studios has the meta-achievement game within the campaign which will unlock more information as meta-goals are met. It might not hurt to stand at the rear of the battle and then rush in when you see more of what the enemy looks like before throwing down your hard earned gold coins.